One of PES 2018's most tantalising features is the return of 3-on-3 co-op matches – and you can test this multiplayer element right now via the game's online Beta, which went live today. The beta is free to all, across both PS4 and Xbox One – so you don't need PlayStation Plus or Live Gold – and supports both 1 vs 1 and 3 vs 3 gameplay. You can play as Brazil or France, at the 'Neu Sonne' Arena, with fine or rainy weather settings, either in the day or at night. It runs until 31 July and Konami is already inviting feedback via a comprehensive user survey. Initial social media feedback seems positive, and GR+ will share its thoughts soon. In the meantime Konami has added two caveats regarding the beta over the course of the day. "As per the in-game message, we're aware that matchmaking can take time. Rest assured this will be fixed for the full version," it said on Twitter. Also of note, from the official PES account: "A quick one, player stats/OVR in the Online Beta are not the latest or final." For those unable to find the demo on their respective format, Konami has reminded users to make sure their Store is set to the correct region. 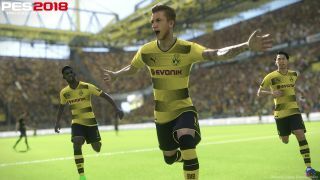 PES 2018 is out on 12 September. For more impressions, check out 7 ways PES 2018 is looking to outplay FIFA 18.